Last week’s post-Brexit immigration leak revealed a government so utterly without answers to the big questions facing Britain, that their only idea to defend the rights of citizens is to strip those rights from our families, friends and neighbours. The concessions made to balance tough borders with access for the most skilled Europeans are an attempt to divide this movement. We must not lose sight of our vision of a just migration policy, one that has Britain doing its part, not just to protect living standards and freedom of movement but to tackle the root causes of forced migration in a divided world. Like Trump repealing Deferred Action for Childhood Arrivals (DACA), the proposals would leave countless EU citizens undocumented, including many who have lived here for decades or have British children. It will push them deeper into a hostile environment that is already devastating the lives of non-EU migrants and communities of colour. They will then be made vulnerable to extreme exploitation and even incarceration, the number of EU nationals in immigration detention having already increased five-fold since the referendum. "This is a plan that puts the government first, not 'Britain first'." This is a plan that puts the government first, not 'Britain first'. Laid down with no regard for independent advice, based on flawed assumptions about migration's economic and social impacts. It makes sense only as a last-ditch strategy for self-preservation by a weak government which has wrecked our economy with years of austerity and relentlessly misrepresented the realities of Brexit. The proposals pander to the racist breed of right-wing populism that so many people are fighting hard to counter with street demonstrations and acts of solidarity up and down the country. No doubt, its authors tell themselves they are giving at least Leave voters what they voted for but this illusion is only maintained by the failure of the media to interrogate both widespread misconceptions driving public concerns and what drives forced migration itself. The leaked document proposes to pull EU nationals into a system that gives different rights to different social classes and racialized groups; a system that has already devastated countless lives and continues to fail even on its own terms. These are basic rights, not frilly privileges; the right to work and family life; right to healthcare and education; to freedom of speech and from arbitrary detention. By creating a total hierarchy of rights based on immigration status, the proposal indicates a complete and final betrayal of Britain’s commitment to human rights. Last Wednesday, the government promised ‘balance’. Defence Secretary Michael Fallon promised the end of freedom of movement but added that the government will not “shut the door on highly skilled people who want to come here and make a contribution to society.” But as anyone with any experience with our immigration and asylum system can tell you, the door is already shut. This is a country that makes its recognised refugees homeless, wrongly deports thousands of international students and systematically discriminates against migrants in every area of life. Even those sheltered from the worst by high-paying jobs, are not immune from the shattering precarity and sense of not-belonging threatened by a hostile environment. "Promises of balance are a skillful attempt by the government to placate the most privileged elements of the migration justice movement and so, divide it." 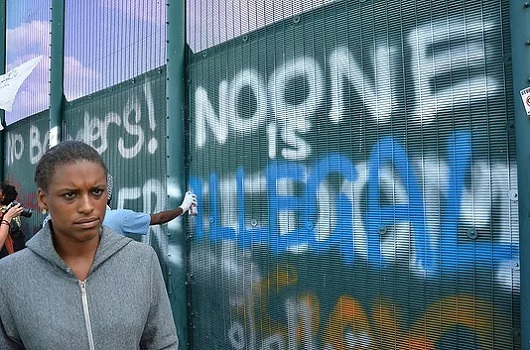 Promises of balance, in continuing to welcome‘highly-skilled’ EU nationals, are a skilful attempt by the government to placate the more privileged European elements of the migration justice movement and so divide it. Meanwhile the most marginalised, ‘unskilled’ migrants are demonised as being responsible for this, a long sustained decline in UK living standards. While dividing and ruling, this tactic also helps sweep the role of austerity, deregulation and corporate lobbying under the carpet. On a deeper level, by implying only high-wage earners make a meaningful contribution to our society, Fallon betrays the government’s attitude to the UK’s working majority, whether they are born here or not, working in industry, the service sector or caring for our sick, elderly or children. These kinds of contributions - the ones that pay little but hold our whole society together - are made predominantly by women, with those from non-EU countries facing some of the worst exploitation and discrimination. It’s been said till faces are blue, that if you meet a migrant in hospital they are more likely to be treating you than ahead of you in the queue. Dig a little deeper and that’s the most important connection between immigration control and public services. For years, this same attitude has been evident in government austerity measures. They wilfully dismantle our public services and welfare state with one hand, while the other points the finger of blame at migrants and their families. By doing so, they have made immigration control their Trojan horse. From within, they hope to ride into the welfare state and burn it down, once and for all. "The government has made immigration control their Trojan horse. From within, they hope to ride into the welfare state and burn it down, once and for all." As the government readies this charge, it falls to parliament and the public to stand in its way; to demand democratic accountability for decisions vital to our future and transparent, honest discussion before the point of no return. The leaks reveal a disdain for these principles reminiscent of the government’s conduct through closed-door trade talks, when Liam Fox MP deliberately side-stepped public scrutiny to sign CETA without parliamentary debate. If left unchallenged, the government’s hostile environment will be set on a course of infinite expansion. As well as pulling three million EU nationals into the sphere of constant precarity, stigma and fear once known only to those migrating from beyond the EU, they have abandoned British citizens to it, too. We have black British children being passport checked in our schools and patients with foreign accents being ID checked in our hospitals. How long before we see income thresholds for medical treatments and student loans? None of this is necessary in one of the world’s richest economies. The rich and powerful have always used racialized and gendered exploitation to drive a race to the bottom, both here and abroad. That means, and recent years have proven, that how society treats new arrivals is a pretty good indicator of how the rest of us can expect to be treated a few years down the line. So, if we want a public debate that can defend and extend all our rights, we can no longer afford to discuss immigration in isolation from what drives it. Doing so is like trying to grow a tree by giving it earth to root in but no light or water. "Mass migration is inevitable in a system that says, with every act of violence, disposession and exclusion, that poor lives, like black lives, don’t matter." However many rights are taken and however many walls are built, mass migration is inevitable in a system that says, with every act of violence, disposession and exclusion, that poor lives, like black lives, don't matter. It is inevitable in a world where 24 people are forced from their homes every single minute of every single day. While politicians mudsling around freedom of movement, frontline communities worldwide are more concerned with their right not to move. Most migrants as well as refugees are forced from their homes, whether by neo-colonial exploitation, conflict, climate chaos or the global, racial and gender inequalities they entrench. Refusing to confront or even acknowledge the powerful interests driving forced migration, the only thing they’ll talk about cracking down on is the people who have to get out of the way, just to survive. Restoring real ‘balance’ to our immigration policy means taking responsibility for Britain’s role in this crisis and asking the big questions about where we go from here. Either we consent to live in a hostile environment or we can demand a real debate on migration, to establish how an international system based on justice and mutual respect could deliver dignity to everyone.